Caleb Ekuban stepped off the bench to score the winner eight minutes from time as Ghana edged out Kenya’s Harambee Stars 1-0 in the final qualification group match for the 2019 African Cup of Nations. With the victory, Ghana toppled Kenya to finish top of the group, with both teams having advanced to the final tournament even before this match at the Accra National Stadium. Stars had defended well, for most of the dead rubber match, until the defense went to sleep for a moment allowing Schlupp to run onto a through bal before shooting low, the ball trickling down Matasi’s body. It was a game of few chances with Stars looking comfortable at 0-0 while Ghana were looking to get a win, though their tact upfront always failed them. Christian Atsu, who turns out for English Premier League side Newcastle United was Ghana’s best player of the night, but his runs oft bore little fruits. Stars had a chance four minutes into the game when Eric Johannah floated in a beautiful low cross from the right which forced keeper Richard Ofori to sprawl to the floor and parry it away, seemingly headed for the bottom right corner. Ghana’s first chance at goal was in the eighth minute when they won a freekick in a promising position, but Thomas Partey’s attempt was inches over. On the other end, Johannah’s attempt at goal after dummying away from his marker was deflected for a corner that was well defended. The Sweden based midfielder had another go at goal after 19 minutes when he cut in from the left, but his shot went just wide. Andre Ayew thought he had scored the opening goal after 33 minutes but it was cancelled out after he was adjudged to have fouled keeper Patrick Matasi. The Ghanaian skipper had risen to head home across from Atsu with Matasi spilling before they clashed for the rebound. At the stroke of halftime, Ghana had another chance when Kwadwo Asamoah floated in a brilliant freekick from the right but John Boye’s header was inches wide. In the second half Kenya started bright with Masud Juma forcing keeper Ofori into a fine save just a minute in when he raced onto a long ball from Matasi before firing a shot at goal. Juma was replaced by Piston Mutamba with the lanky Sofapaka striker going straight into business. In the 63rd minute he battled two Ghanaian defenders before playing the ball through for Johannah, but he took a heavy touch the keeper coming out to collect. Ghana continued to create chances with Atsu the orchestrator and in the 73rd minute a good move with Ayew teeing him up inside the box was futile as he shot wide under pressure. 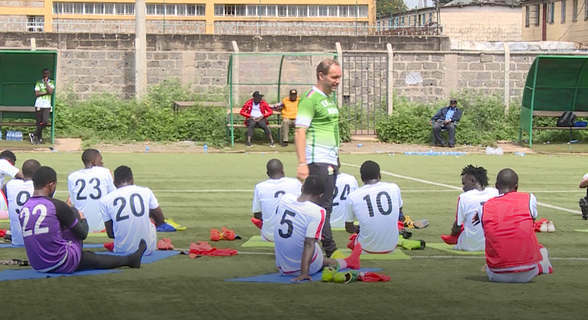 With the clock ticking, Migne made his second change, going all defensive with Johannah coming out for Bernard Ochieng to make his senior team debut. But Kenya were expsed defensively finally with Ekuban scoring on his birthday. Having gone down, Migne went attacking again, pulling out right back Philemon Otieno for Paul Were, but it couldn’t salvage the situation as Ghana held on for the win.